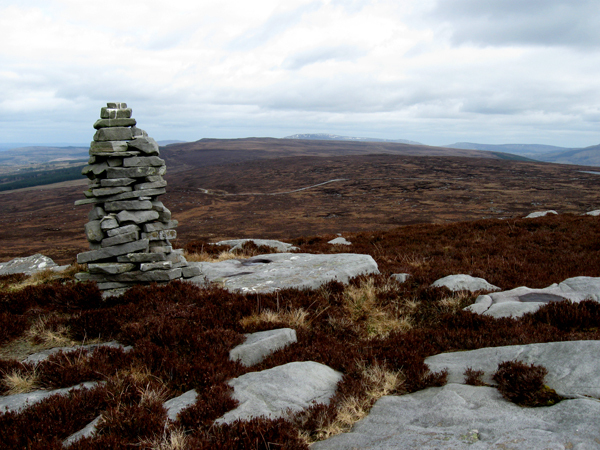 Ballaghnabehy Top is the 882nd highest place in Ireland. From the west Cavan village of Dowra we got lost in a labyrinth of small roads and lanes, eventually arriving at point G955315 A where a gate barred further car-bound progress. We were now on the Leitrim Way, and it was a simple matter of following the track up through the forestry. After a pleasant half-hour or so we emerged onto open hillside, and as the ground steepened, the track zig-zagged up to a plateau and to Doo Lough, a small gem in an area of otherwise remarkable bleakness. This vast area of high moorland is curiously nameless. In his North Leitrim Glens book David Herman refers to it as The Glenfarne Plateau, and it is called Boleybrack on some environmental signage near Doo Lough. But local people seem not to have a name for it.